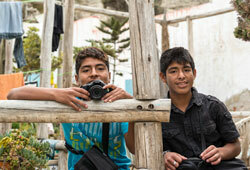 In August we welcomed 4 new teenagers to the FairMail team in Peru. This brings the total amount of teenagers financing their education through the sale of their pictures to 61. After Anidela and Diana retired earlier this year and with 2 boys turning 19 soon, it was time to look out for some new talent. Read more about how FairMail selects teenagers below. When we have vacancies, we inform our local partners who also work with at risk teenagers. 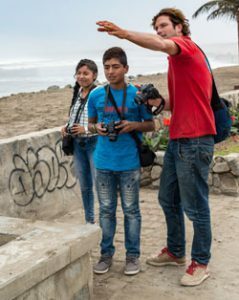 In Peru these are an organisation that works with families who work on the garbage belt, a boy’s home for former street children and a school in a shanty town. As we already cooperate with them for many years their social workers and psychologists can suggest us potential candidates to enter FairMail. This time we invited 2 girls who live in El Milagro (the part of Trujillo where the garbage dump is situated) for a 3-week trial period. Together with 2 boys from the Mundo de Niños boys home for former street children. Read more about Anayeli, Melany, Gerardo and Azabache on their personal profile pages. The 4 candidates get an official job interview to hear a bit more about their motivation and their personal situation. And to get a clear explanation about the trial period during which we will be evaluating them on FairMail’s 5 core values: Motivation, Honesty, Responsibility, Punctuality and Respect. Every week they get feedback on their behaviour so they can also find out if they like being in FairMail and want to give what it takes. After the trial period the candidates are evaluated by the team, based again on our 5 core values. In this case 3 of the teenagers were approved and for one teenager we decided he needed one more month to prove his honesty. If the approved teenagers want to become a part of FairMail we explain them about the participation contract which states the teenager’s and FairMail’s rights and obligations. As the teenagers are still underage their parents also must sign. With their participation contract they also sign their camera lending contract which means they can take their FairMail camera home from now on. And then it depends on their motivation (and a bit of luck) how long it takes before they get their first picture selected for a FairMail card. To start earning money with their pictures. We wish Anayeli, Melany, Azabache and Geraldo all the best and hope to see their first FairMail cards soon!